Keep Warm and Save Energy! 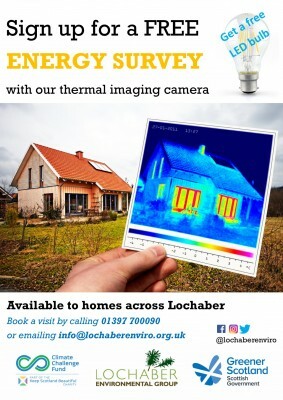 Lochaber Environmental Group are offering free energy surveys during 2019 to households and businesses in Lochaber. The energy surveys are part of the Go, Grow and Glow Project, funded by the Scottish Government’s Climate Challenge Fund, to help people in Lochaber reduce their carbon footprint. Our energy advisors will come along to your house and survey the house with our thermal imaging camera to check for any cold spots. They will also install a temporary energy monitor to see how and when you use energy. At a second visit they will bring back a report on their findings and offer you some advice and guidance on where you can make improvements. Improvements are often a combination of behaviour change and physical installations. Physical changes can be as simple as adding draught proofing or replacing your lights with LED’s or if you are looking to make even bigger improvements, we will also advice you on wall/loft insulation and renewable energy.